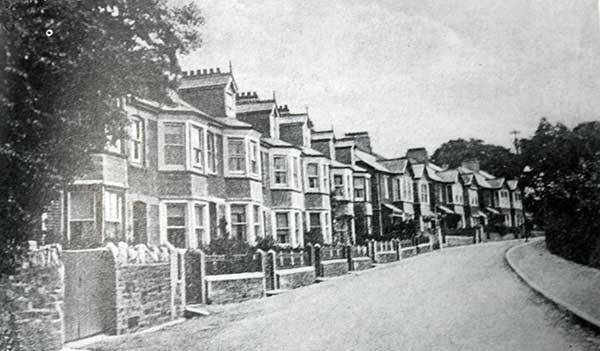 Exeter Street and Tavistock Road | Launceston Then! ‘In the first year of the 19th century an Act was passed in continuation and amendment of the measure of 1781 dealing with the Launceston roads, and extending its powers to the road from the “West Gate under Madford in Launceston by Docacre, to the North Gate in Launceston,” and this in its turn was amended fourteen years later. Under the provisions of these Acts, the North Road (now St. Thomas Road), the Exeter Road, and the Tavistock Road were made, but, in the making, several relics of the town’s former station were swept away. The West Gate was the first to disappear and much of the outer wall of the Castle followed in its wake when the North Road was made. But the worst result of the latter improvement was an unintentional one. The town had resolved to spare the Witches’ Tower (which stood fifty or sixty feet high at the corner of Castle Dyke facing the White Hart, and by which the road had to pass) but the work weakened the foundations, and, in an unusually severe storm one night in 1834, the tower was blown into the road. In the same year the North, the second of the three old gates of the town, was deliberately demolished, on the ground that it interfered with the traffic— a pretence disposed of by the fact that the traffic by that time had been diverted to the North Road.’ By Sir Alfred Robbins 1885.